The members of the Children’s Center “Circle of Friends” group of supporters remains very active at the center, and its members visit the center frequently. On January 11th, famous young Armenian pop singer Silva Hakobyan visited the children. She brought them candy and toys, as well as CDs of her music. The children were thrilled to spend an unforgettable day with Ms. Hakobyan, dancing and singing away! Most people like to celebrate the New Year with close friends and family. FAR’s Children’s Center staff and it’s supporters have become like family for the children residing at the center. On December 29th, a group of Santa Clauses and Snow Maidens (Dzmer Pap and Dzyunanush) visited the Center, in order to help the children celebrate the New Year. The visit was organized by Mrs. Javahir Tsarukyan, a member of the Center’s “Circle of Friends.” The party began in the afternoon with New Year songs, and it continued with plays, dances, and gifts. The celebration was a uplifting experience for the children, and FAR thanks the Circle of Friends for making the party possible. 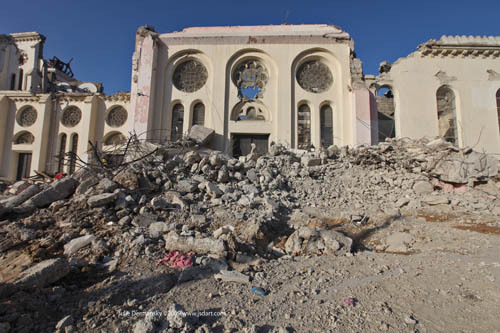 Thanks to the generosity of you, the Eastern Diocese and the Fund for Armenian Relief (FAR) raised $30,000 for the earthquake relief effort in Haiti, between January 13 and 22. The funds—which were raised through collections in our local parishes, as well as through direct donations to the Diocese and FAR—will be distributed through Church World Service, the humanitarian aid arm of the National Council of Churches, with a long record of effective outreach to those in need around the world. You can still contribute through our secure FAR Donation Page, please designate the money to “Wherever Most Needed” and write “HAITI” in the comment line. Today we would like to highlight the recent efforts of a friend of the FAR family, photographer Julie Dermansky. FAR is proud to have worked with Julie, who recently took photographs at FAR’s Twentieth Anniversary Celebration held in New York City on January 15th. In the past, Julie has also traveled to Armenia in order to photograph our project sites and beneficiaries. Julie Dermansky is now in Haiti, aiding NGOs working in cooperation with the World Food Program in undertaking a major food distribution effort. Below, please find some captivating recent images from Haiti, as photographed by Julie. Click here to visit her personal blog and view more photographs. As we noted in our January 13th posting, you can contribute to the Hatian relief effort through our secure FAR Donation Page. 100& of the collected money will go to the relief effort in Haiti, to be distributed through Church World Service, the humanitarian aid arm of the National Council of Churches. You can contribute through our secure FAR Donation Page, please designate the money to “Wherever Most Needed” and write “HAITI” in the comment line. It has been 21 years now since the earthquake that destroyed large areas of Armenia—and 21 years since the world’s beautiful outpouring of goodwill towards Armenia and its people. It was then that the Fund for Armenian Relief came to existence and with your help and support we reached out to provide relief to hundreds of thousands Armenians. Over these past two decades, the memory of our sorrow in 1988 has been re-awakened several times, when natural disasters have struck our fellow human beings in other corners of the world. A sense of solidarity in suffering has inspired FAR family, our compassionate people to provide aid to these fellow victims of devastation. This week, another such tragedy has taken its toll—this time on the island nation of Haiti. In a region already beset by difficulties, this natural disaster has been especially destructive, and the images coming out of the news have been terribly disheartening. Today, we are appealing to you to donate to the relief of this disaster. The Fund for Armenian Relief (FAR), will be contributing to the effort to assist the earthquake victims, working through the National Council of Churches. All proceeds collected—100 percent—will go to the relief effort in Haiti, to be distributed through Church World Service, the humanitarian aid arm of the National Council of Churches. The Children’s Center Council of Friends held their second annual holiday charity dinner earlier this month. The dinner took place at the chic Ojakh restaurant in Yerevan. The council of Friends is a group of government officials, civil servants, and members of Armenia’s businesscommunity who support FAR’s Children’s Center. Mrs. Bella Kotcharyan, Armenia’s former first lady, opened the program by thanking all supporters of FAR’s Children’s Center. The beneficiary children provided entertainment for the guests, and charitable contributions totaled to almost 5.5 million AMD. In early 2010, The Children’s Center and the Council of Friends will propose a plan for the allocation of the funds. For the last few years, the Jerair Nishanian Foundation has provided a few lucky students with the gift of an education. Each year, through FAR, the foundation sponsors approximately fifty students who are working towards their degrees at Gavar State University. Recently, FAR’s Edward Karapetyan and Levon Lachikyan visited Gavar to meet with some of the program’s beneficiaries. The scholarship recipients, all of whom maintain stellar academic records, gave the FAR staff thank-you notes addressed to the benefactor, in an effort to show their gratitude to Mr. Nishanian. As a Christmas gift, Mr. Nishanian mandated that his foundation provide each current scholarship recipient 10,000 Armenian Dram as Christmas present. FAR is very proud to have Mr. Nishanian as a benefactor, and we thank him for his continued support.